Periodontal disease – commonly referred to as gum disease – is a condition caused by an accumulation of detrimental bacteria and plaque in between the gums and teeth. The good news is, gum disease can often be successfully prevented (or sometimes reversed) when proper plaque control and oral hygiene habits are practiced. First and foremost, brushing and flossing on a daily basis is essential to preventing the development of periodontal disease. Brushing with a dentist-approved toothbrush can help remove harmful plaque that has built up on easily accessible surfaces of the teeth. 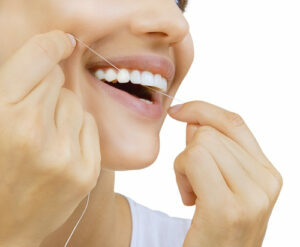 Flossing can detach plaque and food particles in hard to reach areas such as between the teeth and/or under the gumline. In addition to these methods, rinsing daily with antibacterial mouthwash can be an excellent way to further improve oral health. This product works to eliminate the bacteria responsible for plaque (and ultimately gum disease), effectively supplementing the efforts of a good brushing and flossing regimen. It is important to note that no matter how often you brush, floss, or rinse with mouthwash, visiting the dentist is also vital to preventing periodontal disease. While at-home hygiene techniques are certainly helpful on their own, some plaque buildup can only be removed successfully by a dental care professional. For the majority of individuals, our dentists – Dr. Jonathan Coombs and Dr. Don Chiappetti – recommend scheduling a routine teeth cleaning at least twice a year to help maintain optimal oral health.